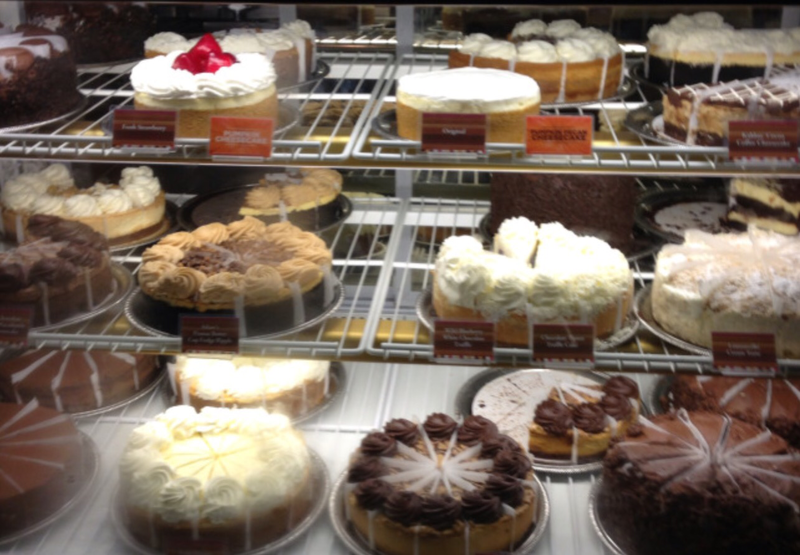 In the USA, there is a restaurant chain called the Cheesecake Factory , which I have mentioned previously, there they have a multitude of flavours and styles. Me, I am not normally a baker, but on high days and holidays I do occasionally splurge. 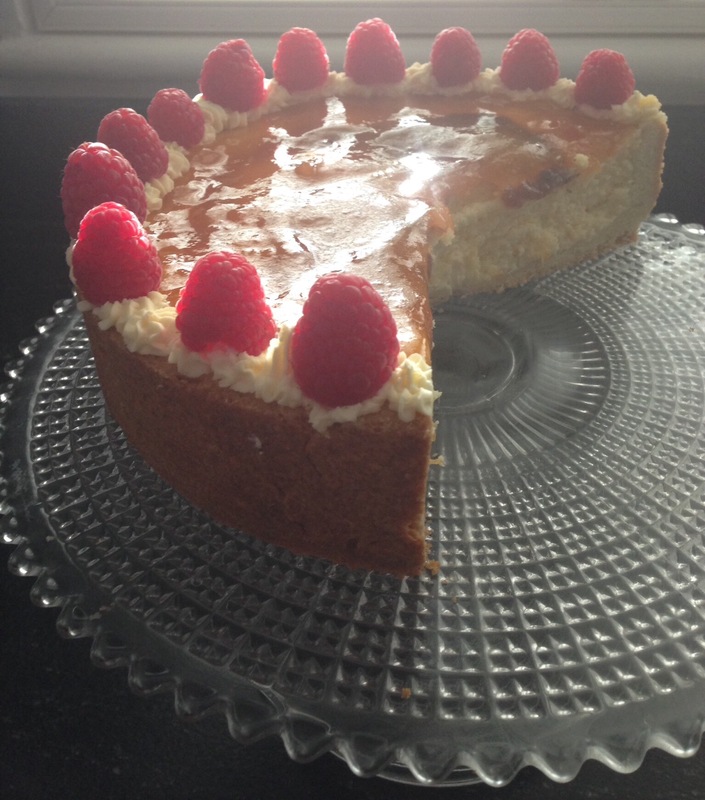 One of my standards was always a very basic cheesecake, but this weekend I upgraded it to a more visually exciting cheesecake, although in reality it was simplicity itself. 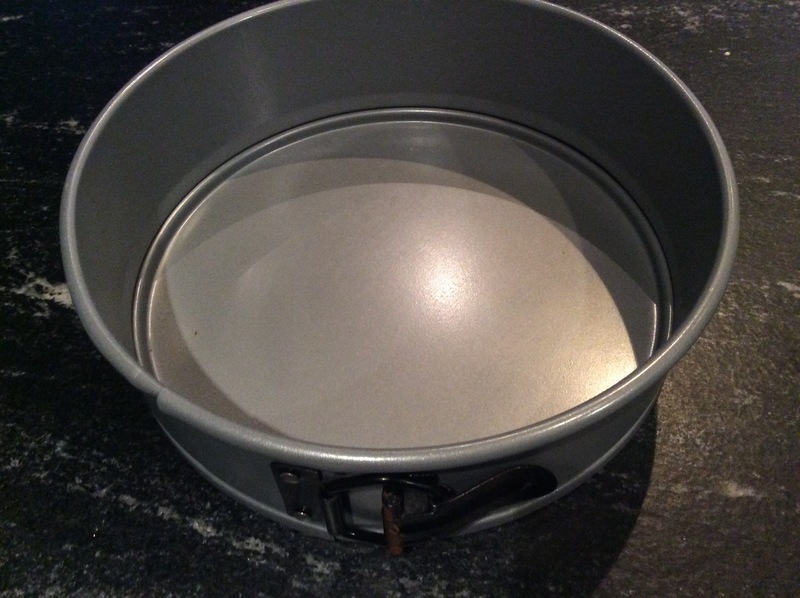 To make my cheesecake you will need a 23 cm ( about 91/2″) Spring form pan ( one which releases the bottom when unclipped) preferably a non stick one, so much easier to clean and to release the cake. The cake is surrounded by a rich pastry crust, which is made by tipping all of the ingredients into a food processor. Heat the oven to 180 C place the rack in the middle of the oven. 6 (1/2cup) cream beaten together with an egg yolk. Cut the butter into chunks,add to the food processor and wizz of a few seconds until it stops clonking. With the machine running pour in the egg/cream mixture, the mixture should form a damp ball very quickly. If it is not forming a ball add a few more drops of cream. Remove the dough from the machine and knead it lightly together. Divide the pastry into three and rollout one third into a rough round about the size of the tin. Place in the bottom of the pan and using your knuckles press it to fill the pan up to the edges. Roll one third out into an oblong about the size of half the diameter of the tin, place it on the sides of the tin and repeat with the rest of the pastry. Again using fingers and knuckles press the pastry bottom and sides together to make a smooth lining to the pan. Some whipping cream and raspberries , smooth apricot jam all for decoration. Put the cream cheese which has to be at room temperature, into the food processor, and wizz for a few minutes until smooth. Add the cream, lemon zest, vanilla essence, sugar (150 grms) and egg yolks. Beat until mixed making sure to scrape the sides down so that everything is incorporated. Beat the egg whites until stiff and then add the rest of the sugar, beat until stiff again but smooth and not dry. Fold the whites into the cream cheese mixture gently until fully incorporated. Pour the mixture into the chilled pastry case and place in the middle of the oven and bake at 180 C until the the top is puffy and the sides golden. The top will be a little soft. Remove from oven and place away from draughts as they will cause the cake to sink.Some sinkage will occur. Leave to cool and then carefully remove the springform sides. When totally cool, refrigerate for several hours. In a pan or microwave proof container put the contents of about 1/2 a jar of smooth apricot jam, add a teaspoon of brandy or whiskey and heat gently until very liquid. 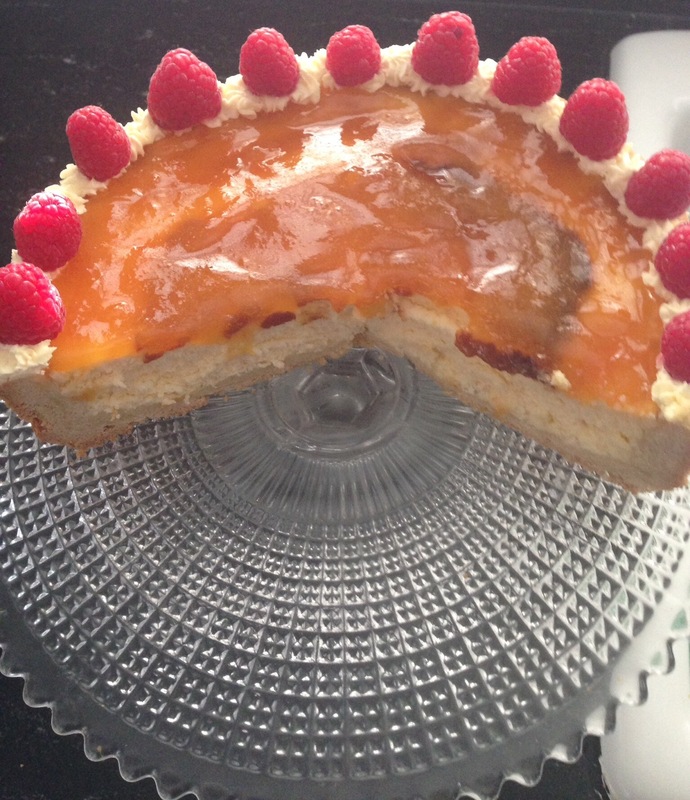 If the top of the cake has sunken a little or if the edges of the pastry ar uneven, then carefully slice off the top. Brush away any crumbs that remain., pour over the melted apricot jam but only onto the cheese part. Beat the additional cream until stiff and “Pipe” around the edges and decorates with raspberries. It is very easy and fairly large will serve at least 12. Keep refrigerated . 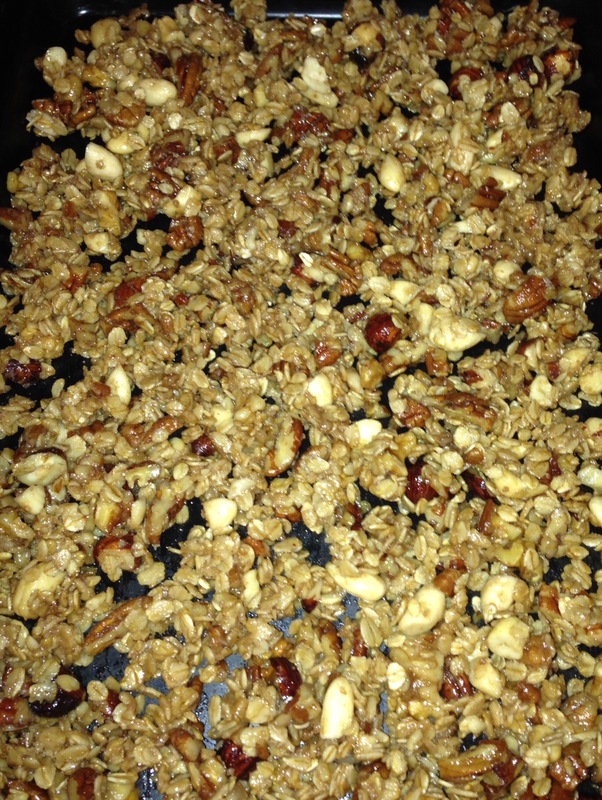 One, Two,Three it’s Easy, homemade Granola, that is! There is a lot in the news about food, always has been and I assume always will be. What is good for you, what is bad for you, too much sugar, too much fat, eat lots of it, avoid as much of it, and so on it goes. Recently the news was processed hams, bacon and sausage were terrible for you. However it all has to be taken into consideration. If you had nothing but a diet of Bacon ( bad), baked beans ( Bad) sausages ( Bad) fried eggs ( ?) steak ( red meat =Bad) along with ketchup ( Bad) then one would assume that you would not be long for this world. However, the average person does not eat like this, everything in moderation and most importantly Variation. 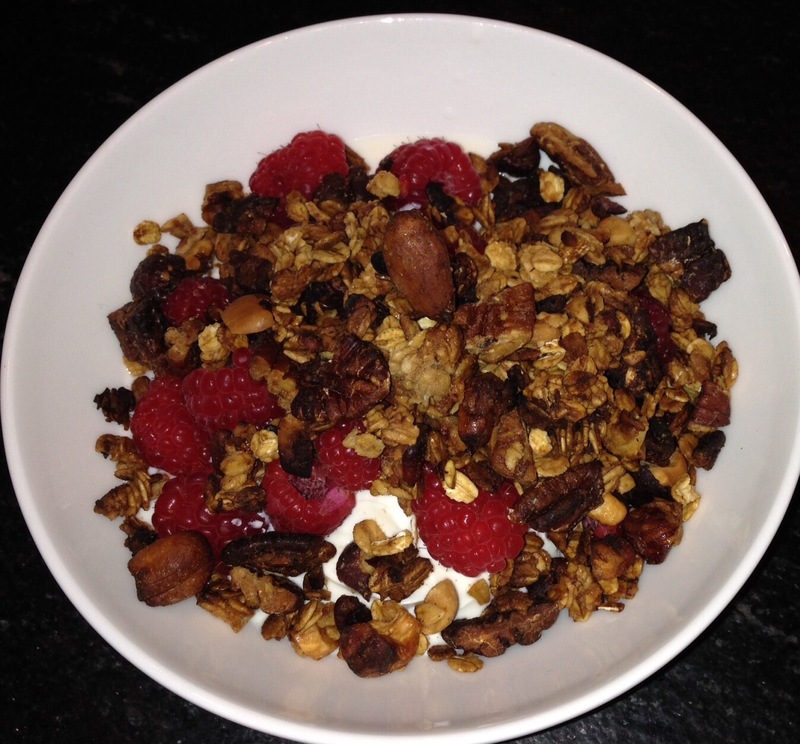 In this weeks Sunday Times ( UK) there was an interesting article on Granola, another of the “In” foods, and of course depending on the brand or type of Granola you choose there are many variations in quality and price. One of the “in” Granolas, is the one created by 22 year old model and food blogger Danielle Copperman. However, I am not sure how much of a nutritionist she is. When looking at the Glycemic index of various types of sugar, with Glucose weighing in at a hefty 100, Sucrose ( table sugar) 65, Honey at 61, and moving down the scale Maple Syrup at 54, Otange Juice 50 and Agave and Fructose at a lowly 13. So, Agave which is a plant native to Mexico and Agave syrup is 55-95% Fructose and Fructose is metabolised by the liver. It is not suitable for diabetics and has no nutritional value whatsoever . It also can not be heated as it gives off harmful toxins. And finally on agave syrup it has been banned by the Glycemic Research Institute of Washington. Meanwhile, I like Granola, sprinkled over my yogurt and berries, but I like to make my own as then I have a better idea of what I am eating. Heat the maple syrup with the oil, when warm, add the nuts chopped, keep on the low heat and stir for about 5 minutes. When the nuts are golden add the beaten egg white and stir in. 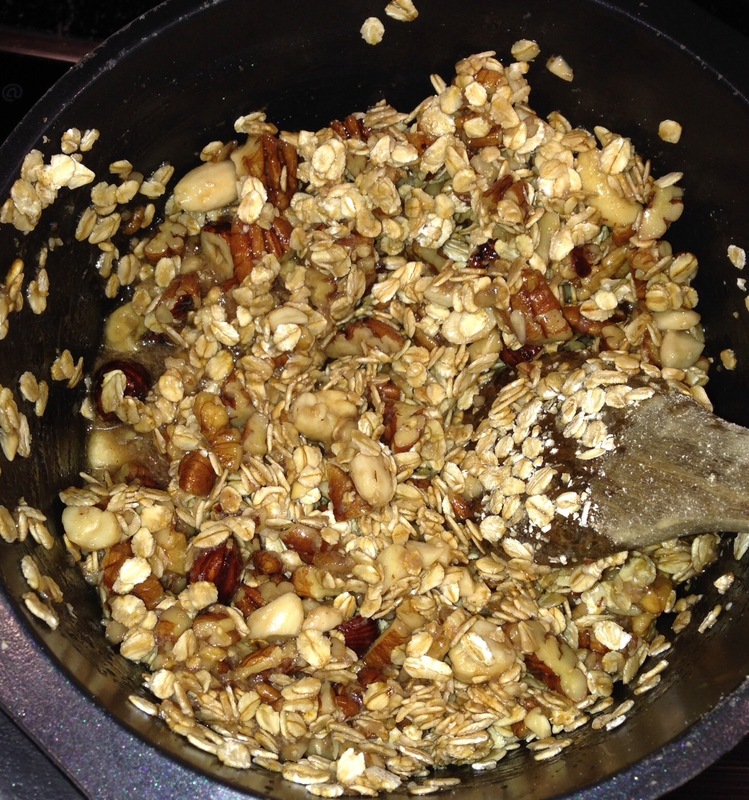 Remove from heat and stir in the oats until throughly mixed. Spread onto a nonstick baking tray and bake at 170 C for 20 mins. Be careful to keep an eye on it and stir from time to time to avoid the edges burning. Leave to cool and mix well, when totally cool put into an airtight container, will keep for two or three weeks easily. The Ivy has a baby sister! Or even two. 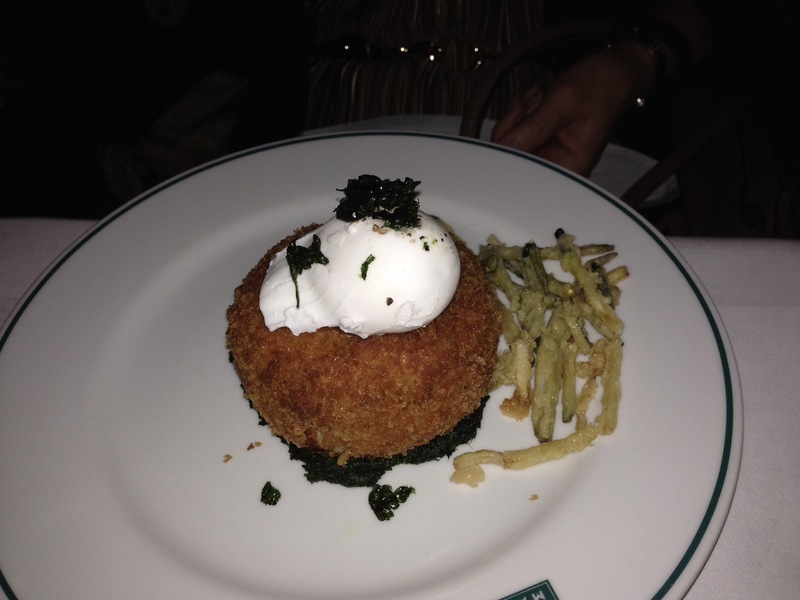 Many restaurants have sister restaurants but this is a one and two for the eponymous restaurant that is the Ivy. The Ivy is in fact in two parts, the Ivy and the Club at the Ivy. Anyone can go to the Ivy, (providing you can get a reservation) it is affordable and a fun place to go and people watch. The Club at the Ivy, is a private members club and I assume that is where all of the A-Z listers hide out. The Ivy, is part of Caprice holdings, which includes Daphne’s Caprice, J. Sheekey and Scotts (16 in all). The Ivy is very discreet, hidden down a side street in Londons west end, as is Caprice and J. Sheekey. The new off shoots, The Ivy Chelsea Garden ( March 2015) and the Ivy Market Grill ( November 2014) are more visible, one on the Kings Road in the Chelsea area of London and the other right on the very busy square of Covent Garden. We tried the Ivy Market grill and the first thing we noticed was that we were able to book for 8 people. Many of central London better restaurants will not take such a booking, maybe for lunch but not for dinner. The second thing that we noticed was it was the same very smart interior and very smooth service. So how was the menu? It too was similar in feel to the Ivy. An eclectic choice to suit all tastes and for central London it was affordable. The restaurant is open from 8 am until late, so open for Breakfast, Brunch, Lunch, Afternoon Tea, Pre theatre dining, Dinner and Post theatre! So fine dining all day ! We were spoilt for choice, but I chose the seared scallops which were just wonderful, they were served with truffle creamed potatoes, Parmesan crisp and shaved truffle. 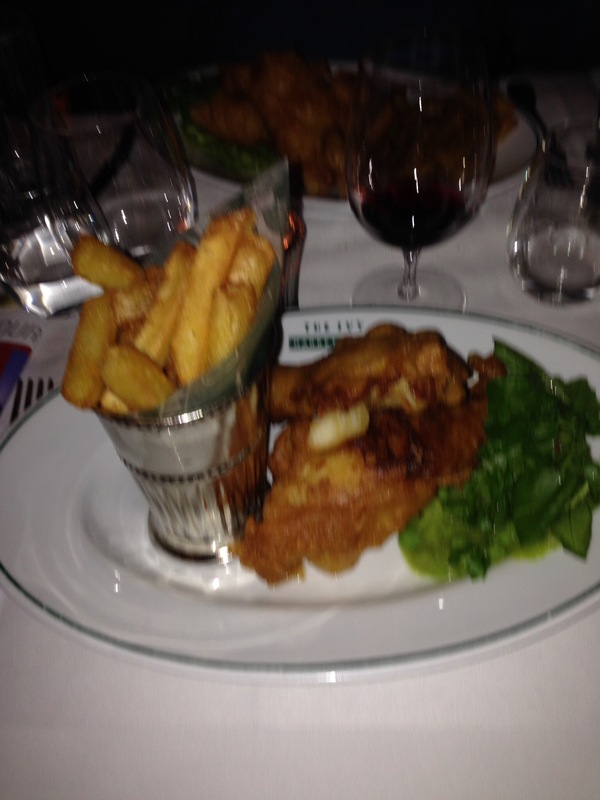 However for me the test was Fish and Chips. This is my all time comfort food, and if I were a condemned woman, it would be my request for my last meal. But, if it were not up to scratch then I would be sorely disappointed. Although this my number one meal, I rarely have the chance to eat it hence I am really fussy where and when I eat it. Not for me if the batter is soggy, not for me if the chips are floppy and cold. They both have to reach my standard. The batter has to be crisp and dry , the chips, firm, hot and crisp. Deal on the south coast is a small old town ( dating from before the 13 th Century) is the home to an old fashioned Fish and Chip restaurant, the kind which sells Take Aways in the front and has a small un inspiring restaurant in the back. Their Fish is perfect, but the chips are very English, a bit boring. Then there is Sittingbourne, a town in the middle of Kent, which has seen better days. They too have an old fashioned kind of Fish and Chip restaurant, where they even serve Kiddie size portions ( you have to be a big kid to eat it as the portion size is not small) for OAP’s. Again they reach the mark with the fish, but fall short in the chip department. 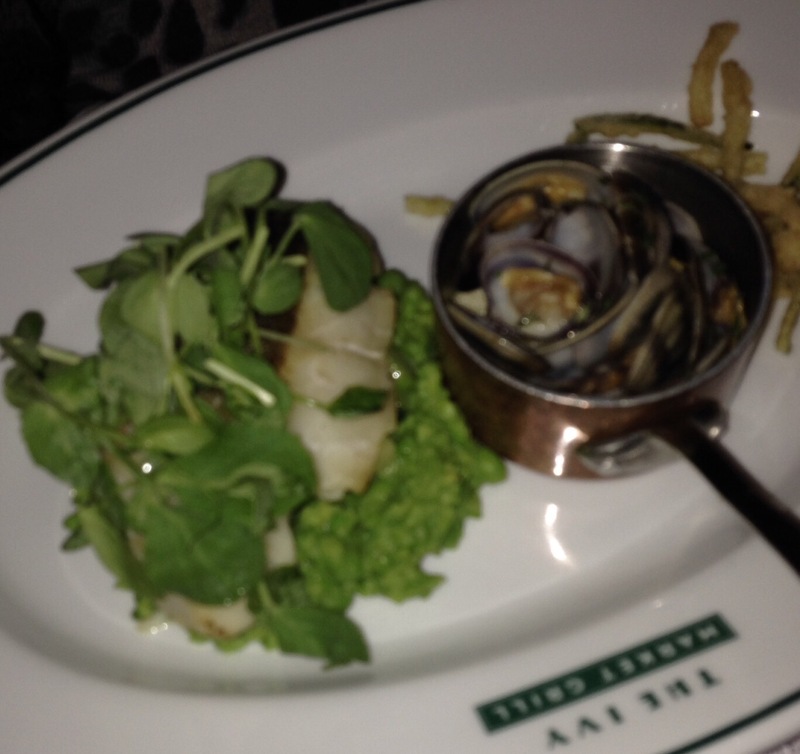 Move on to Marlow in Buckinghamshire to the award winning 2 Michelin starred Pub of Chef Tom Kerridge. He, who currently has a Pop Up restaurant in Harrods. Again, he has great fish with wonderful crispy batter, but for the chips again fell short. I am convinced that they are extruded, they were crisp but the interior was just not right and in dong some research I discovered that many chefs use this method,i.e. make mashed potato and pipe it out in exact lengths before deep frying. So onto the Ivy Market Grill, and bingo, the Fish and Chips hit the spot, the batter was crisp and dry and so were the chips and hot! Wonderful. And the Mushy Peas, well forget those, no one serves real mushy peas these days. Mushy peas are dried marrowfat peas which are first soaked overnight in water with bicarbonate of soda then rinsed in fresh water and simmered with a little sugar and salt until they are soft and mushy. Very often food colouring is added to keep them green. Nowadays, many restaurants serve “Mushy Peas” but in fact what they do is take peas ( probably frozen) cook them and then mush them a bit. I have to admit this way of eating peas is preferable to either balancing them on the tines of your fork ( English style) or using your fork as a shovel ( American style) , but they are Not Mushy Peas! 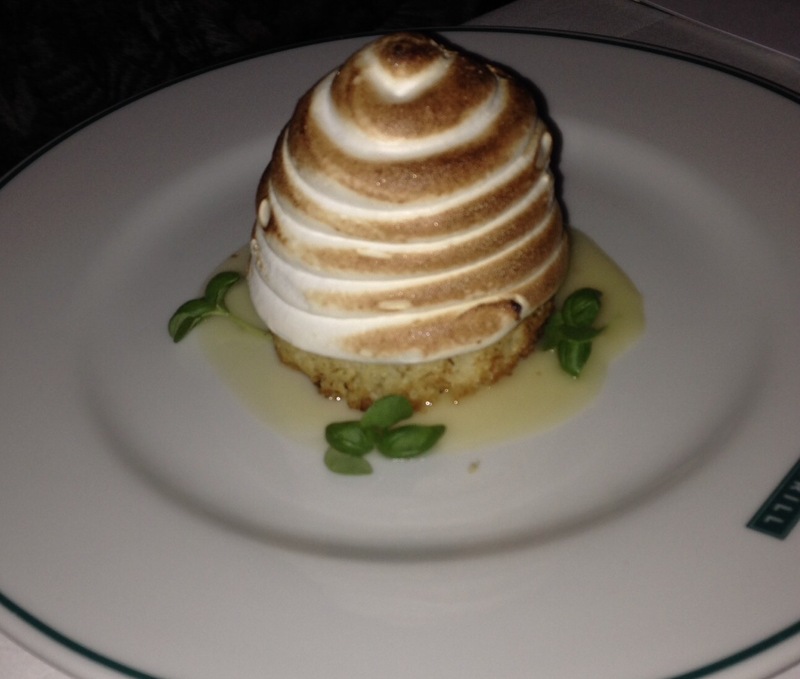 Only one of us tested the desserts, but it looked an impressive Baked Alaska. 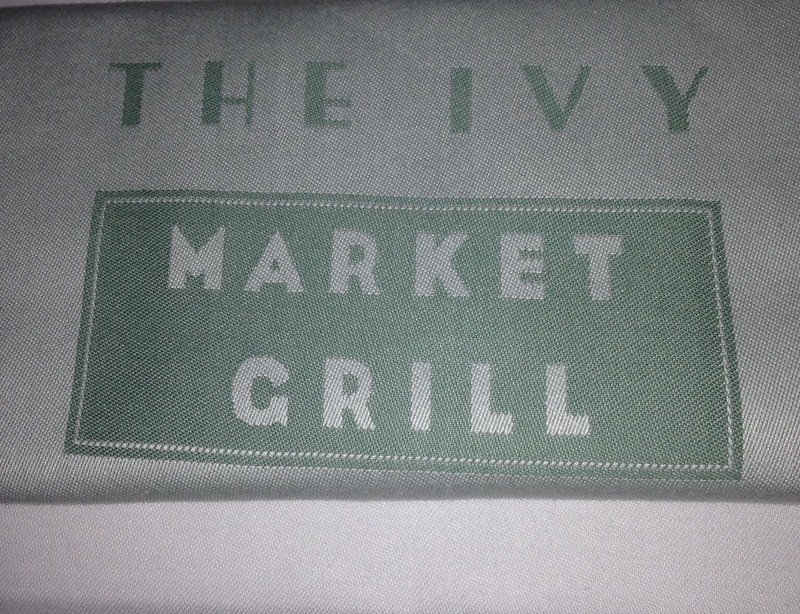 We left the Ivy Market Grill more than satisfied with our new find and I am sure we will return. One final note, according to my sources, Richard Caring who owns this group of restaurants, was the man behind the Brasserie style cafes called Côte. This chain has now been moved on but the new kid on the block from th same team is Bills. Cheaper than Côte, marginally, not as slick as Côte, but it works, we love it as there is one about 30 seconds from my front door, so what’s not to like?